Tio Rico Where In The World Are You!? Have you found yourself in a pinch financially and need help fast? The monthly bills are piling up quicker than the paychecks are coming in and you seem to have exhausted all other methods for getting the cash you need today. Lucky for you, Tio Rico Te Ayuda is an Arizona based financial lender with a proven track record of helping individuals get out of sticky situations. 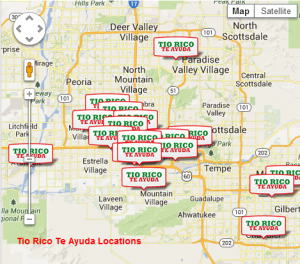 And with numerous Tio Rico locations across the state of Arizona you are sure to find one in convenient proximity. The highest concentration of Tio Rico offices is surely in the most population dense city of Phoenix. With over ten different locations spanning from Thomas St. to 51st Ave down to Broadway up to Bethany Home Rd., Tio Rico has the city of Phoenix, and the surrounding areas of Glendale, Mesa, Chandler, and Avondale covered. If you are looking for a personal loan, auto title loan or need fast cash, stop by one of our greater Phoenix locations and speak to a qualified representative today. Individuals living in the Tucson area do not fret; Tio Rico has your city covered as well. With two locations in the heart of downtown Tucson on 1st Ave, and another in South Tucson on 6th Ave, residents of the area will be able to get the loans they need quick and easy at either location. Don’t hesitate to stop by during normal business hours: Mon-Sat: 9am-7pm! At Tio Rico, we are excited to announce the newest opening of our Casa Grande location. Conveniently located between Phoenix and Tucson, the Casa Grande office offers all the same services. From auto title loans to one-hour cash loans, Tio Rico offers dependable, straight-forward service during every visit.